All screen caps are taken from FringeFiles.com. All observations are mine and therefore could be totally off the wall, and/or wrong. I have not read or looked at any recaps or reviews. The glyphs have already been spelled out and the Observer has already been sighted so I’ll skip that part. Let me try to recap before I dive into details. We have a case of the week where someone drains people’s happy memories. The murders happen on the other side though. Astrid is trying to hook up Olivia with Lincoln from our side but she refuses. Walter is still going crazy, covering everything up so he won’t see the man in the mirror. 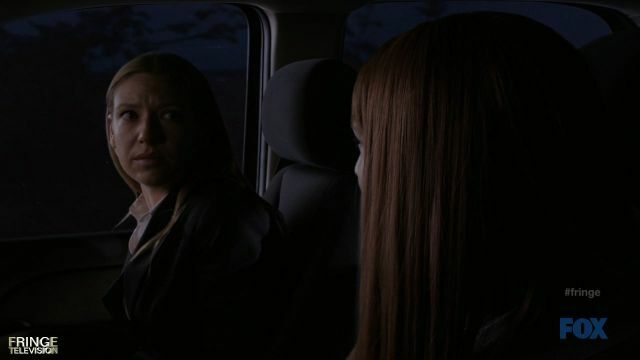 Fauxlivia asks Olivia to help in this investigation and so Olivia reluctantly goes to the other side. Turns out, the killer over there is a professor over here and his assistance is also needed. Of course nothing works out the way it should and now fires have to be put out. 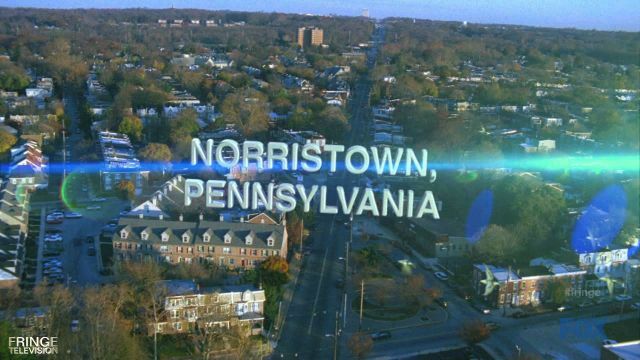 Olivia has memorized a license plate with which they can find the location of the killer. The professor is trying to meet with “himself”, to stop the killings but becomes a victim himself. 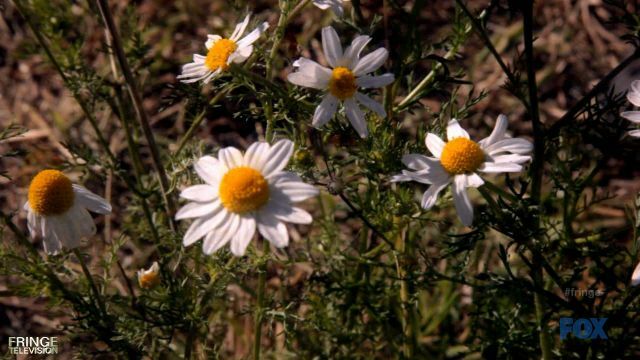 Because of different choices made, although the same person, they have had different lives. One was influenced by good, the other by bad. In the end the killer kills himself and the professor is rescued but doesn’t remember anything, not even the person who influenced him in a good way. All he remembers is a phrase. 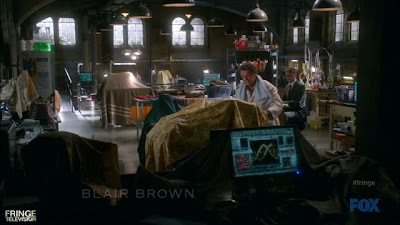 Back at the lab, Walter is hearing voices again and of course it’s Peter asking for help. So this is the device with which the killer drains the memories. It is attached to the victim’s head. 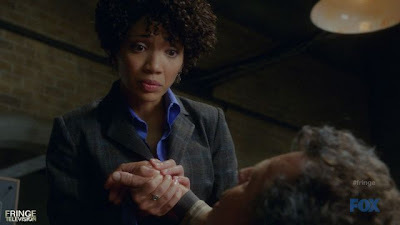 Tapping into other people’s memories is nothing new to Fringe. 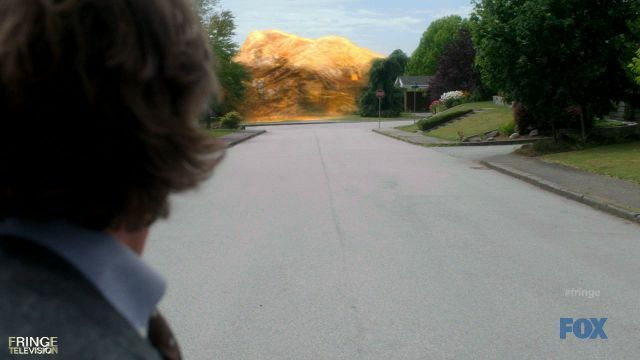 In 1.04 The Arrival the Rogue Observer listened to Peter’s memories to find out where the Beacon is. Green and red in the lab with amber-ish colored blankets. Walter is covering up everything. He’s afraid he’s going to see Peter (he doesn’t know that it’s him) again. Not sure if I said it last week already, but it will be really interesting to find out why they kidnapped Olivia, why there is hate between the worlds and why the machine exists. 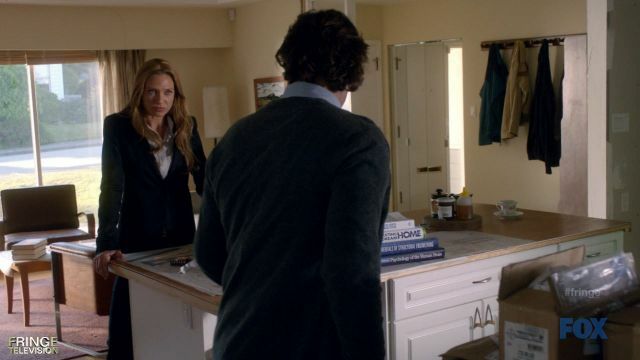 Olivia comes in, way too chipper in my opinion :) and asks about the redecoration. 1.06 The Cure – Intrepus’s shares fell $23 in the stock market after Estebrook was arrested. 1.10 Safe – 23 years ago Walter hid equipment in safety deposit boxes. 1.14 Ability – The bomb was at 923 Church Street. 2.02 Night Of Desirable Objects – Walter got in contact with the paralytic substance and informed Peter he had to urinate in 23 minutes. 2.06 Earthling – The security tech informs Olivia (watching the tape) that this was 23 seconds before the victim was discovered. 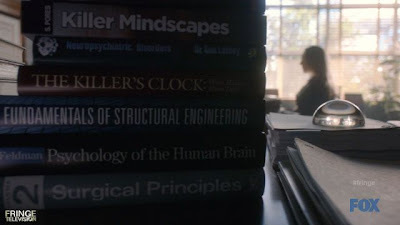 3.04 Do Shapeshifters Dream Of Electric Sheep – The lab was on the 23rd floor at MD. 3.20 6:02 AM EST – Brandonate told Walternate that baby Henry inherited 23 chromosomes from Fauxlivia. 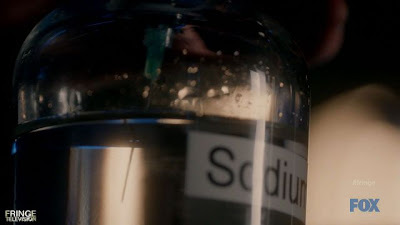 According to wiki 23 is the atomic mass number of the stable isotope of sodium. I’m going to make the assumption that this is why they showed this. Olivia hasn’t heard about those murders before because they happened over there. 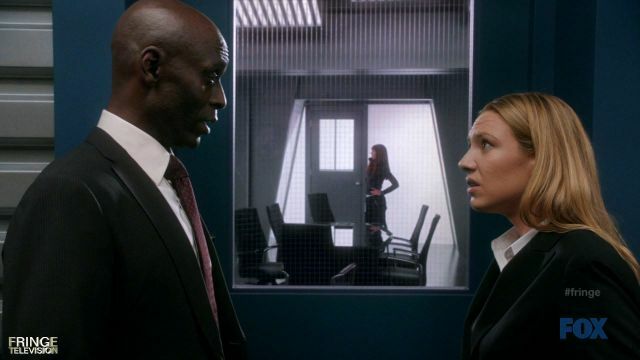 Broyles informs her that Fauxlivia requested her assistance and I think, it’s not really something she’s looking forward to. They meet with Fauxlivia who explains the case and what she needs. 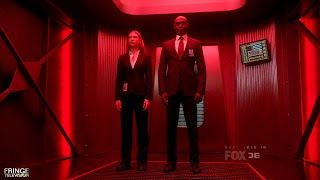 She also says that she went through all of this with her Col. Broyles. Uh, what, how? I guess in this time line nothing is as it used to be. Can’t wait to find out how this will be explained. Olivia asks why they need to do it over there and Fauxlivia says: “…we want him to see where the killer was living. 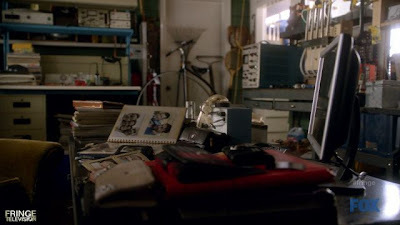 If--if he can, uh, interact with the space, study his belongings, he can glean something that we can't.” Olivia: “Well you hope you can.” Fauxlivia: “Well, I lived in your apartment and I picked up a lot of things about you.” Her smirk is just evil. Grrr, okay, I don’t have anything against Fauxlivia but: be careful, you don’t really know anything about Olivia as you will later find out. 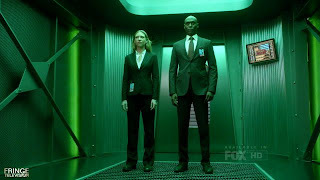 So Olivia wants to speak to Broyles: “Saving people's lives is important. Of course it is. But--but I mean, have we even thought this through? Picture (bottom) is from 2.21 Over There Part 1, just before they cross. It’s usually Broyles who voices concerns if a plan works or not. They also talk about John Louis McClennan. He is a professor over here studying serial killers. And over there he is a serial killer. I guess even across universes there is a fine line between genius and insanity. Broyles also seems to interact with Olivia like he has in the beginning of S1, all little more distant and not that warm and fuzzy. over there on top of the shelf, next to the tank. There are a few differences. The leaves are greener on our side (top). And over there is missing a building (bottom). 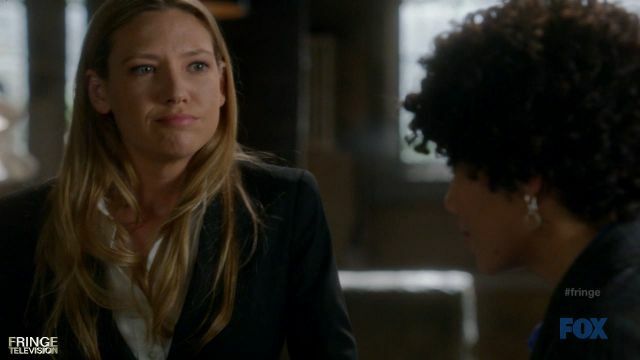 So did Olivia recognize Agent Lee and/or the other way around? 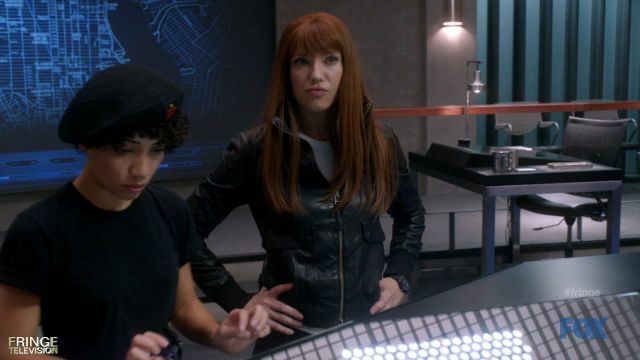 Fauxlivia is going undercover as Olivia. I’m just going to put it right here: Anna is amazing. Her timing, her eye line is right on. The interaction with “herself” was so fun to watch and I forgot that it’s the same person playing the two different characters. All the awards in the world to you! 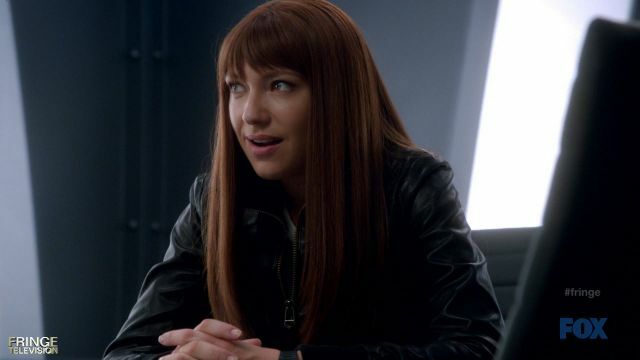 When Fauxlivia put the blond hair on, she said Frank likes the red. So because there’s no Peter, there’s no baby which means there was no reason for Frank to leave. So then we get a moment in the lab. 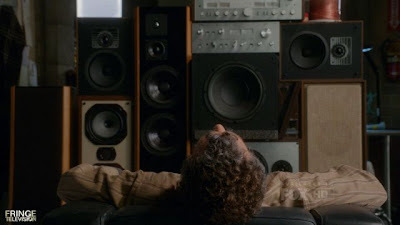 Walter is sitting in front of the speakers, listening to Mozart’s Requiem. It also plays on the turn table at the end of the episode. Astrid walks in and scolds him, I guess. She checked his meds and they are off. Walter has been experimenting on himself again. I think she really wants to help him but has no idea what is bothering him. She grabs his hands just like in 3.20 6:02 AM EST. Back then I think he reciprocated, but now I don’t think he did. And as he gets up, he still walks in a pattern and covers more screens. Olivia and Lincoln are in the van, listening. There’s some more green and red action going on. 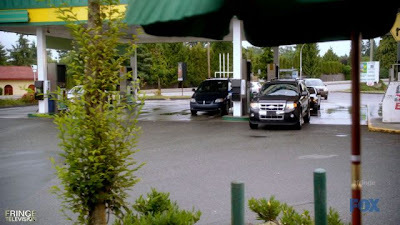 And there is also a lot of green at the gas station. At one point all the cars there were blue. Back at the house John discovers the candy stash. Mm and there is taffy in one of the cups. 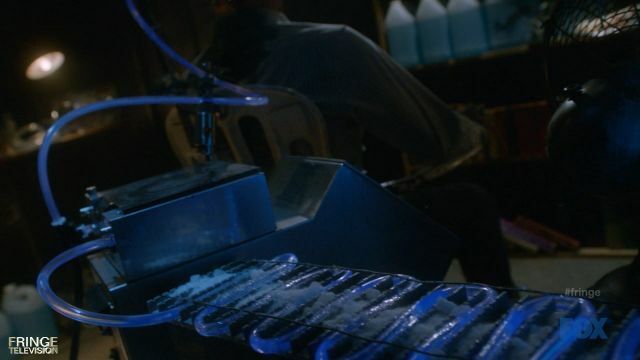 Walter was making taffy in 2.16 Olivia. In The Lab. With The Revolver. So they discover that the killer hunts during the day. And after that pretty much nothing goes according to plan any more. 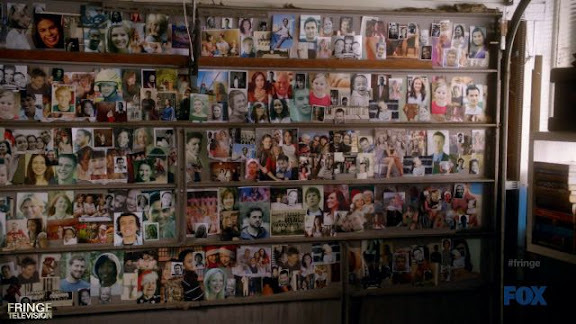 Fauxlivia forgot to remove some pictures of John's father and of course this John recognized him. Back to the gas station. The little girl has to go to the bathroom. 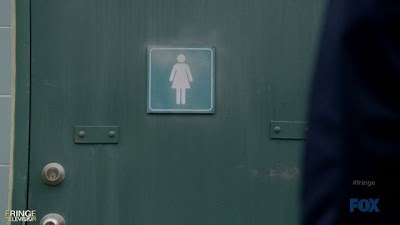 And what we see is a person dressed the same as the killer, (who has been observing the mom and the little girl) waiting in front of the bathroom door. 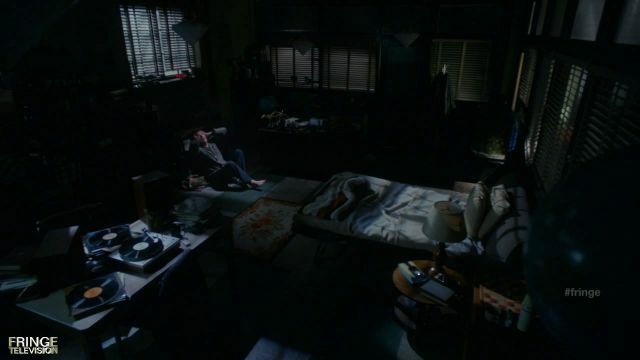 This reminded me of 2.06 Earthling where the shadow entered the motel room, the little girl sitting completely still on the bed. And 3.04 DSDOES when Walter comes back out of the elevator, along with Ray who was a shapeshifter. In all three instances I was holding my breath, thinking they are going to get killed or shifted into. But then of course it wasn't so, phew. Oh I forgot, there is one of those old bikes parked in the room. As John runs out of the house you can see a lamp in the living room. There wasn't a good shot of it but I think it has leaves on it, maybe as in the glyphs. So Olivia is trying to explain: “In this universe, some things are the same, and some things aren't. People... make different choices and -- and therefore end up in different places. I guess this dialog is a reflection of what our characters are experiencing right now, when there is something missing in their lives. So back at Fringe HQ. Both Lincoln and Fauxlivia are taking full responsibility for what happened. 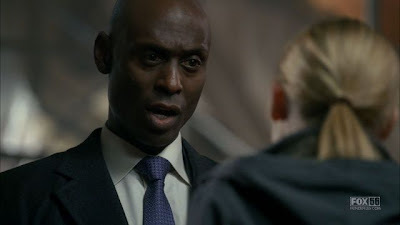 But Alt-Broyles doesn’t want to hear any of it. Olivia makes a suggestion and he listens to that which of course Fauxlivia doesn’t like at all. Mwahaha! So Alt-Astrid runs a probability on how to find John who has disappeared. But it would take too long because while both Olivia’s were talking with him, the mom from the gas station disappeared. Olivia’s photographic memory will help. She memorized a license plate on the picture with John’s father on it. With that they can figure out where he might have gone to find… “himself”. See Fauxlivia, you don’t know that much about Olivia. That’s an answer she didn't expect and frankly, neither did I. In the old time line Olivia had just shot him twice but he didn’t die (1.06 The Cure). She was telling the story to Peter. and the half apple which is also a glyph. So John the killer shoots himself after he realized he took the only thing away that stopped John the professor from becoming like John the killer. 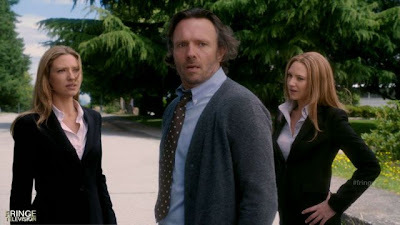 The professor survives but has no memory of what happened. Especially the memory of Marjorie is gone. As Olivia leaves John says: “You know what they say. That even when it’s the darkest, we can step into the light.” Olivia: “He knows what she taught him, but he can't remember who she is. How is that possible?” Broyles: “At the risk of sounding sentimental... I've always thought there were people who leave an indelible mark on your soul. 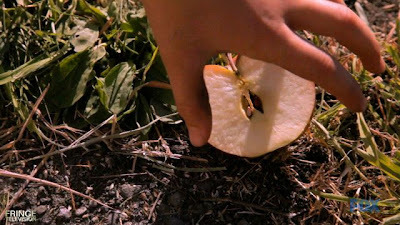 An imprint that can never be erased.” It’s okay Broyles, you can get sentimental. You are talking about the people who are like family to you. Back at the lab Walter hears Peter’s voice again asking for help. Yep. Walter knows that too. -Once the professor gets released from the hospital someone has to keep an eye on him, because the memory of Margery is permanently lost. She was the only one who could keep him from turning into the killer his alternate turned out to be – because of different choices that were made. 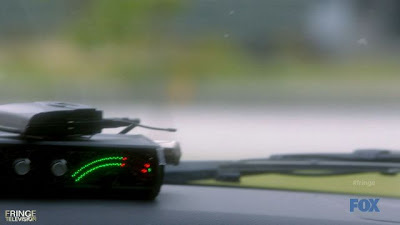 Wow, awesome episode again and I can’t wait for Friday. Haha! Your interpretation her not liking Olivia suggestion at HQ somewhat out of context. I love the Double Mint Twin look in this episode. I wonder if we will see the flip side this season, or would it be over the top? All this bias against the other Olivia. All the Olivia coloured glasses will never cloud my perception that everyone negates. A) Can't forget that the mission was her idea. Her intent was genuine. She is quite invested by the case and took failures personally. B) Her defensiveness (what people call cockiness) suggests a struggle we've yet to see. C) This Olivia is not that unaffected by her time on the other side. D) Her powers of observation is innate. "The photo is gone." Double thumbs up! Xindilini, that was not my intention (taking something out of context) can you explain your fist sentence or is what follows your explanation. Gee. I left out a lot words in my first sentence. I just meant I didn't get the sense that the other Olivia was peeved by her counterpart's suggestions to Broyles. I thought they were all on board for tracking the prof in the first place. I find the double filming in Fringe HQ interesting. The dizzying spin was cool. But the other Olivia did cross the invisible line twice with her hand gestures in the split screen. I would assume they are using green screen, and not split screen for the double Olivia shots, that way they can overlap if needed. Anyone catch who played Marjorie? It's not on the IMDb cast for the Episode. Didn't notice on the credit the end, guess I'll try ti check it out. according to the Fringe Wiki, Margery is portrayed by Julie Schnekenburger. I'm sorry I totally agree with Fauxlivia seeming perfectly nasty against our Olivia. However, I'm glad that our Olivia is standing her ground. 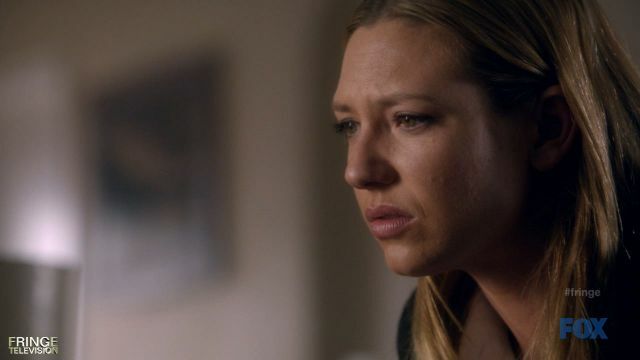 She isn't just taking Fauxlivia's little annoying comments, she can totally take care of herself ex)stepfather. 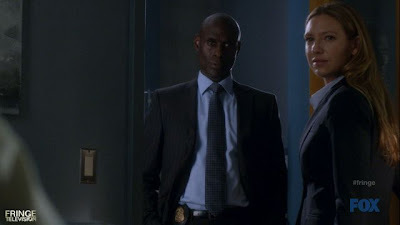 I just meant I didn't get the sense that the other Olivia was peeved by her counterpart's suggestions to Broyles. 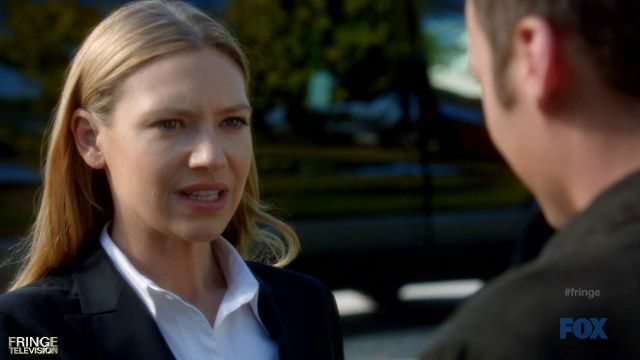 I thought they were all on board for tracking the prof in the first place.http://www.filmdiziseyret.gen.tr/seyret/yabanci-diziler/fringe I'm sorry I totally agree with Fauxlivia seeming perfectly nasty against our Olivia. However, I'm glad that our Olivia is standing her ground. 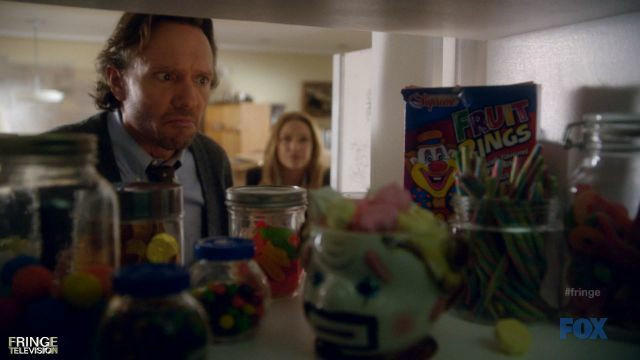 She isn't just taking Fauxlivia's little annoying comments, she can totally take care of herself ex)stepfather. It's my second favorite thing to do - look for stuff. The first one of course watching episodes over and over.